Interview with Meg Doll, chatting about how to make keto adjustments, your most powerful biomarker, the reason you feel hungry on keto, and so much more. Dealing with a health obstacle can be really scary, and even when you’ve worked up the courage to fight, it’s hard to know where to turn. As you work towards better health, sometimes new issues will pop up, and sometimes it makes you question yourself — not just your ability, but your worth. I want you to know that wherever you are in your healing journey, you are worth it. Whatever obstacles you have overcome, whatever obstacles you have yet to encounter, you are always, ALWAYS worth it. I want you to know that even when you feel defeated, you are courageous. You are so worthy. I am always inspired by people who share their journeys truthfully: the setbacks, the missteps, and everything in between. Sharing your journey is not only healing for other people, but also for yourself. We need to be honest about what we’ve overcome and our fears about what has yet to come. Sharing those feelings is empowering — we can take the power away from the obstacle and the fear and step into that power for ourselves. You deserve to redirect that power. In today’s podcast, I chat with our guest Meg Doll, Registered Holistic Nutritionist, blogger, podcaster, author, and total girl boss. This episode is all about where to start in addressing your health, biomarkers of health, the long process of healing, the factors that contribute to better healing, and more. My doctor-approved 12-week keto training program closes registration TODAY (April 22) at 11:59pm PT. The response for Happy Keto Body has been unreal, and I’m so thrilled to see our members loving the program so far. If you’re looking to eliminate frustrations, get fat adapted and stay fat fueled for life, register for Happy Keto Body today. 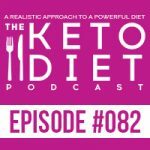 Leanne Vogel: You’re listening to Episode Number 82 of The Keto Diet podcast. Today, we’re chatting about how to make keto adjustments, your most powerful biomarker as a woman, the reason you feel hungry on keto, and so much more. Stay tuned! Hey guys, happy Sunday. The show notes and full transcript for today’s episode can be found at HealthfulPursuit.com/podcast/E82. Let’s hear it from one of our awesome partners! Okay, I got one announcement today, and it’s probably the most important announcement that we’ve ever had on the podcast. Listen up! Happy Keto Body, my 12-week ketogenic video training program exclusively for women, closes its doors today, April 22nd, 2018, at 11:59 PM Pacific. If you’ve been thinking about registering for Happy Keto Body, today is the absolute last day that you can register. Like, the last day. I don’t know when it’s gonna open up again, I have no clue, so it’s best to get in on this now, because I really just don’t know when we’re gonna be offering this program again. If you go to HappyKetoBody.com, you can learn more about it. Okay, today’s guest, her name is Meg Doll. 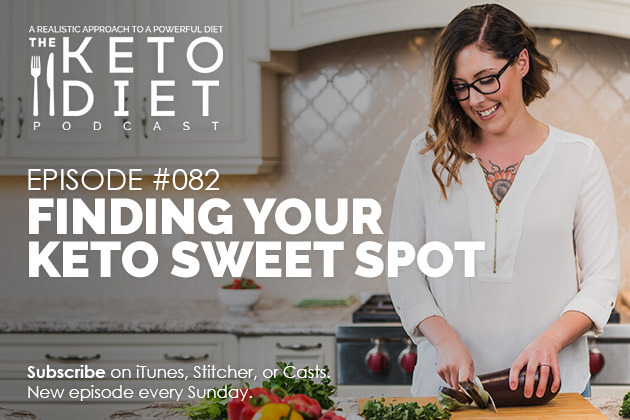 She’s been on the podcast a couple of times, in Episode 19, all about self-love, and in Episode 36 about keto for healing. Meg Doll is a registered holistic nutritionist, author, podcast-er, essential oil educator, and self-love expert. As an eating disorder survivor, Meg is passionate about guiding women to living lives of personal freedom and supporting them, and cultivating a deep sense of love for themselves. Meg’s book, Keto Freedom, debuts in December 2018. I’m so excited for her to share her story, both in paperback form and on today’s show. Now, in today’s episode, Meg mentions a bunch of different blood tests and stool tests, and I just want to let you know because Happy Keto Body is closing its doors today for registration. Happy Keto Body also comes with lab testing. That means that much of the lab work that Meg mentions today is actually inside Happy Keto Body and you can request lab work with a third party that we partnered up with on this project. Super exciting. Again, that’s HappyKetoBody.com. Okay, without further ado, let’s cut over to this episode. Hey, Meg, how’s it going? Meg Doll: Hey girl. It’s going great, and it’s so nice to be chatting with you. Leanne Vogel: Yeah, we were saying before we started recording, it feels like it’s been forever since I chatted with you. I’m so happy you’ve come back on the show. Meg Doll: Yeah, well with your travels and everything, gosh. It has been awhile. Leanne Vogel: I know, seriously. For listeners that may not be familiar with your work, why don’t you start off by telling us a little bit about yourself? Meg Doll: Yeah, for sure. I am Meg Doll, and if you follow me on social media or want to, I’m Meg the RHN. A lot of people know me as Meg the RHN, and RHN stands for registered holistic nutritionist. I began my journey by studying dietetics in university, and just realized that I wanted to dive into more of the holistic aspect of things, the holistic way of healing. I studied holistic nutrition at the Canadian School of Natural Nutrition. From there, I just launched my own business. I love helping women really find their health and their freedom. Freedom is huge for me. I have a history of dealing with anorexia. I battled and overcame anorexia two times within my life, and that is a huge passion of mine, supporting women in finding their freedom within their life, whatever that may be. I don’t exclusively work with women with eating disorders, but it’s like, you know, I support women with digestive issues and mental health issues and hormone issues. It’s just all about finding that freedom within their life so they can feel, I always refer to it as like, that “buzz of life.” I want everyone to feel that buzz, and wake up and feel that feeling of like, oh my gosh, my life is pretty awesome, or really awesome. That’s what I’m addicted to, essentially, is supporting women in feeling that way. That’s a little bit about me. I work with people online, so you and I were just chatting off-air how fortunate we are to have these businesses that allow us to work from anywhere in the world. I usually live in Saskatchewan, Canada, but right now I’m actually in London, Ontario. It’s just cool that our businesses are online, and we’re able to hop around. Leanne Vogel: Yeah. I do love the hopping. I don’t think I could stop hopping. In fact, I was asked the other day in an interview, “What’s your plan with explorking? You’re just looking around for the best place to live.” I’m like, “No, I’m legit just exploring the world. We have no plan on settling down.” I don’t think I could stop hopping at this point. It’s really cool that our businesses allow us to do this, and also continue to share things. I think, I don’t know if you’ve noticed, but with traveling, you learn more about your body, and you learn more about other people. I find in different states, there’s different goals and different accessibility to different ingredients. All that has been really helpful in me understanding the big picture. Do you find that as well? Meg Doll: Oh my gosh, totally. I live in Saskatchewan of a little city, I guess it is, of 18,000. Right now I’m in London, Ontario where they focus so much on local ingredients and just sourcing so much locally. The restaurants that I’ve been going to have been phenomenal, and there are those cool restaurants that source everything locally and change their menus up all of the time. Even going to the grocery stores, like for breakfast this morning, I actually just had some goat yogurt that was made not too far away from here. Goat yogurt isn’t something I typically have, but there’s that freedom for me that I love experimenting with my diet, seeing how things make me feel, and whatnot. I know we’re gonna chat a little bit more about that in today’s episode, but yeah, I love traveling. You always learn things, but I love exploring new foods and things like that. That’s like, one of my most favorite things to do. Leanne Vogel: Yes, I agree. How did you find keto, and what does it mean to you? Meg Doll: All right. Keto is not, like, I don’t label anything. If anyone asks me how I eat, I would not say I eat keto or paleo or anything like that. Even though if you did look at the way I eat, the foods that I eat throughout the day, they would fall within those categories if you were to categorize or label things. How I found keto was I actually had a parasite two years ago. It took me a year to actually identify it was a parasite. Once I did, I was experiencing a whole long list of symptoms. You know, I was totally fatigued, like the most fatigued I’d ever been in my entire life. There was days where I really had a difficult time walking around our neighborhood, just because I was so dizzy, which is a symptom that was related to the parasite. The parasite just took a lot out of me, really hit my adrenals hard. I was just studying a lot at the time about digestive healing and overcoming parasites as well. I’m a restorative wellness practitioner, so through that training, I got extensive training and knowledge on parasite eradication. Through that, I learned that limiting my carbs would be beneficial for supporting my body, along with the herbal supplements that I was taking. I was taking bits and pieces of the diet portions of healing away from my studies. At the time, I was eating, like, a paleo kind of template that was including a lot of carb-dense veggies, as I was working out a lot. With the parasite, like I said, it took so much energy out of me. I just wanted to learn how to support my body the best. It really came down to eating in a way that supported my gut and eradicating the parasite, and also supporting my adrenals, because they were really needing some love and support. A huge focus for me was balancing my blood sugar levels and making sure I was getting enough fat. That’s really what keto means to me, I guess, is just really opening up to that life of enjoying lots of fats and not putting a limit on that. Eating in that way, it really addressed my symptoms of having a parasite. I couldn’t tolerate sweet potatoes, plantains, and even winter squash. Every single time I ate those foods, I literally blew up like a basketball. I am not exaggerating, you guys. You can go on my Instagram account and find a picture of me, and it looks like there is a basketball in my stomach. That was the reaction I got every single time I ate something that was more carb-dense. Eating a lower-carb, really high-fat diet was helping me eliminate those symptoms while I used herbal supplements to actually eradicate the parasite. Then also the fat was really helping me feel better, energy-wise. I love that feeling, and I know Leanne, you can relate. You kind of experience how great you feel eating an abundance of fat. I just kept on doing that. Over the year of doing that, I really noticed some positive changes with my adrenal health. Caffeine, even caffeine within cocoa powder or if I wanted a little piece of dark chocolate, I could not tolerate that. My adrenals were like, “No. I can’t even handle this small amount of caffeine.” Once I started eating more of a keto diet, so more high-fat, I’m actually able to tolerate cacao and chocolate now. I even added in some white tea again, and I can tolerate the amount of caffeine in there. A lot of healing can come from certain ways of eating. For me, this keto or this high-fat low-carb, was really healing for me during the time of my parasite. That’s really when I was introduced to eating this way. Leanne Vogel: That’s amazing. I didn’t know your full story, so that’s really cool. I can relate to the whole basketball belly thing. That was me about eight years ago. It was just horrible, I couldn’t eat anything. I just couldn’t eat anything, and I would have that intense pain and a huge bloated belly. If people, or women specifically, have issues that they’re trying to address, where do they even start? How did you piece that together, with the whole parasite thing and how to do it? I understand that you’re educated, so it’s a little bit different, but do you have any tips on how people can get started in resolving specific health issues when they are ketogenic, or rely on a lot of awesome fat? Meg Doll: Yeah. For me, for actually identifying the fact that I had a parasite, I, within my practice, I run comprehensive stool analysis. If you’re working with a doctor or anyone that can run a comprehensive stool analysis for you, definitely get that done. If you’re suffering from digestive issues and you can’t really figure it out, like I was going through this for an entire year, you guys. It was just terrible. Luckily, I was able to run that test for myself, and it came back positive for blastocystis hominis. That’s the type of parasite that I had, and found out that I had, after a year of kind of thinking like, is it mold that I’m dealing with? I just kind of thought, like, “Oh, maybe I have really tanked adrenals.” I ran a cortisol test on myself, and my adrenals weren’t terrible. It didn’t explain why I was feeling the way I was feeling. Just doing that digging work is super, super important. If you’re not a practitioner yourself, I think it’s very important to work with someone that can support you in overcoming whatever you’re dealing with. Leanne Vogel: More of my interview with Meg Doll after this message from one of our podcast partners. Leanne Vogel: I know you know those clients. What is your recommendation on adjustments, and the length of time to follow an adjustment before adding a new one, or adjusting it even further? Meg Doll: Yeah, that’s a great question. When I found out I had a parasite, it was August of 2016. I’m just gonna throw dates out so you guys can kind of get a timeline, because I totally know what you mean, Leanne. I work with a lot of women, and they’re on protocols and we’re not even halfway through the protocol and they’re really frustrated that all of their symptoms aren’t even gone yet. I just want to give you guys kind of a glimpse at my journey and how long it took me to overcome something that was really, really hard for me. I found out that I had a parasite in August of 2016. Because it was a parasite, I’m not one to rely on antibiotics for really anything. In August of 2016, at that point, I don’t think I had an antibiotic in over, like, three or five years. It was a very long time. My immune system is great, thankfully, and I just rely on natural supports if I can. With the parasite, and with the way I was feeling, it was very, it was a very, very serious health issue for me. When I found out in August, I took a round of antibiotics, and then I retested. That was, you know, let’s say a month later. The test came back again positive for blastocystis hominis. I was obviously very frustrated, but I did another herbal protocol. That was three months long, and then I retested again. In February of 2017, that test again came back positive. You can only imagine how defeated I was feeling, but even though I felt defeated, I kind of knew the results were gonna come back positive just given my symptoms. I wasn’t feeling really any better or different, so I had that gut feeling that the results were just gonna be the exact same and that I still was dealing with this parasite. Luckily, at the time when I found out that I still had the parasite, so in February of 2017, I was actually in the states at that time. I was able to get my hands on the supplements that I actually use with my clients who are in the states. This is the protocol that I use as a restorative wellness practitioner. I was able to grab all of the supplements that I wanted to take in the first place, but didn’t really have great access to in Canada. I grabbed all those, and I started another three-month protocol using those herbal supports. Just in June of 2017, I finally got that awesome news that I was free from this parasite. Again, I had that gut feeling that it was gone. The majority of my symptoms were totally gone. I was feeling a lot better, but there was still some lingering things. My parasite was gone, but the parasite wrecked so much havoc on my gut that I actually now was dealing with a bacterial overgrowth. That’s something, Leanne, that’s important to know, is you might overcome one thing, but that doesn’t mean that you don’t have additional healing to do, right? After the parasite, I was dealing with a bacterial overgrowth. Followed another three-month protocol when I found that out. Now I am so grateful for my health. I keep a gratitude journal every day. One thing that I always write down is my health, because for two years, it was very, very challenging, and really hard. We’ve all, I know everyone listening to this show, you’ve obviously gone through some health challenges, and it’s really hard no matter what you’re dealing with. It’s just a really hard time of life. Now I am just truly so grateful for my health every single day. Yeah, that kind of gives you a timeline, essentially. Leanne Vogel: Yeah, and I think the major takeaway and something that I’ve learned with all my health struggles up until this point is the patience and also the gratitude, even when you are going through a difficult time. It wasn’t until I started practicing self-care and gratitude that I ended up getting my period back, and I think that that played a huge role, too, of just being gracious for the things that I did have, and the feelings that I was feeling. Even the little wins, like waking up not so tired. That was a really big deal to me, although the end goal was to get my period back. The fact that I woke up with a little bit of energy in the morning was a huge win, so I like that you mentioned that too. Speaking of cycles and stuff, do you in your practice, or overall with health, and I’d love to get more into the hormones piece at this point, but do you use the cycle as a biomarker for health overall? Meg Doll: Oh yeah. A lot of the women that come to me do have missing periods, so amenorrhea. Thankfully, with my practice, I am able to do some testing. We can go into hormone testing, and I can offer my clients a 30-day hormone panel, so we get this nice big picture of what it is that their hormones are doing throughout the course of 30 days. It is incredible to see the changes in hormones by just focusing on gut health. It’s so important to me, I’ve helped so many women overcome their digestive issues and in turn, regain their missing periods, after years of not having one. Leanne Vogel: I’m glad you mentioned that too, because often times, a lot of women will seek blood tests and stool tests and urine tests. Then I ask them, “How’s your cycle?” They’re like, “Well, I haven’t gotten one in the year.” I’m like, “Whoa, whoa. That is your most powerful biomarker that you have as a woman. If your cycle is off, something is off. I think that that’s a really great way to kind of move forward before anything else, to kind of get a sense of where your hormones are at. Meg Doll: Oh my gosh. That is so sad to me. If you are missing your period or just have hormones that you know yourself are not properly balanced, and you think that’s okay, it is most definitely not. We are female. We are women. We are supposed to be functioning in a way, we are supposed to be fertile. That is the marker of health for women. If we are not, there’s something wrong. I can get really personal here and share my journey with amenorrhea. Due to my history of eating disorders, I lost my period. It came back after actually seeing a reiki practitioner. Long story, but that was back in high school, first year of university. Then it kind of went away again, and I went on birth control, so we know what that’s like. Then as I started studying holistic nutrition, I got off of birth control, and it just didn’t come back. A year later, I actually started seeing some progress in my hormones, started spotting, and got a really, really quick bleed, essentially. Not that full period that I would have liked to see, but things were coming along. Then the following month is when I started to deal with that parasite, when I contracted that parasite. Because of that, I was kind of thrown back, my body was under so much stress. Once I noticed those changes in my hormones, I did not know yet that I was dealing with a parasite, but my hormones changed. That was a red flag for me. I kind of opened my eyes and was like, “Okay, what’s going on here? What am I dealing with?” That’s really when I started digging for things. That is kind of my message here, is if your hormones are out of balance or if you are missing your period, definitely take that as a sign that things aren’t right. You should be doing some more digging. Leanne Vogel: Yes, I couldn’t agree with you more. Kind of aligned with biomarkers in general, what are your thoughts on hunger and healing? What role does hunger play in healing, and can that be used as a biomarker as well? Meg Doll: Oh, yes. Absolutely. I work with so many women, again, that have just kind of uncontrollable hunger. I was one of those women too, years ago. For me, it was a marker that my body was so under-nourished for so many years. I think it can be a marker for a lot of things, blood sugar imbalance, you can get some really extreme hunger. Most often, at least within my practice- and I would love to hear from you too, just dive into this topic a little bit more, because I think it’s not something that is talked about enough is this uncontrollable hunger, or just not being able to satisfy the hunger. I would love to hear what you have found working with women, but for me, it’s typically, like, these women are either really under-nourished; even though they might be nourishing themselves right now, it’s because of years of under-nourishing their bodies, that now their body is kind of almost waking up in a sense and being like, “Feed me! I see you’re feeding me now.” Their hunger cues are kicking back in. Leanne Vogel: Yeah, I find that for sure. Also if a woman is currently on a low-fat diet, a lot of the hunger they’re experiencing is because they’re not eating enough fat, or when they first adjust to a ketogenic diet, within the first 30 days or so, I know that some people can experience intense hunger because their body is like, “Where are the carbs?! What are you doing to me? I don’t want this fat, I want carbs!” Their hunger can actually spike up. Another one that people don’t often give enough power to that’s a real issue for a lot of people is just that emotional hunger, and something that I have always struggled with, and continue to do so, even today, especially now that I’m not using an eating disorder to deal with my feelings. A lot of the times, we can experience intense hunger when it’s actually not hunger, but an emotional feeling that we’re having. If I’m feeling not connected, like if I haven’t talked to friends in awhile, my sister’s been really busy at work, my mom’s been busy and I haven’t just connected with people and friends, I often find that I’m more hungry. I will eat more and I will seek out food as a way to cope with that feeling, instead of taking a moment to be like, “Why am I actually hungry right now?” Nine times out of 10, it’s the fact that I’m feeling some emotion, and I’m not unpacking that emotion. I find that there’s a lot of, “Yeah, but I’m so hungry, I’m so hungry, like frantic hungry, so hungry.” Often times, it’s actually an emotion and not that you’re actually physically hungry. Do you find that as well? Meg Doll: Oh yeah. That’s really where I am super passionate about really stepping into this place of awareness, and always be really aware and mindful of our thoughts and our feelings and emotions, and kind of like you said, being connected with yourself, or kind of in your body. It’s so easy to just have these racing thoughts of, “I’m hungry, I’m hungry, I’m hungry,” but not really taking that time to tune in and be like, “Okay, am I hungry for food? Or am I hungry for quality time with a loved one,” that sort of thing. Yeah, totally on point there for sure. Leanne Vogel: Kind of flipping the script a little bit is how do you know you’re actually hungry? I know both of us dealt with an eating disorder, so I’m sure for you as well, it was pretty… I remember when I was just starting to want to heal my body. I didn’t even know what hunger was, and I don’t think you need to have experienced an eating disorder to be like, “I don’t know, actually, when I’m hungry. I’ve been following MyFitnessPal, and it tells me when I’m hungry and when I need to eat.” Do you have tips on how we can listen to our body and really determine is this hunger, is it emotional hunger, is it physical hunger, hunger? How do we deal with this? Meg Doll: Yeah, and I love this question. Honestly, it could probably be a whole podcast in and of itself, because there’s just so much to explore within this topic, and so many different opinions and places to start and whatnot. To be completely honest, I have so much to say about this, but one of the main issues I see with this is women simply just relying on that stomach hungry feeling, like that empty, hungry feeling within their stomach. They’re ready to eat. I just really want to make sure everyone listening knows that that’s not always the case. That’s not really always what we’re looking for. Hunger can show up in so many different ways, and another personal kind of story of mine, I always love sharing kind of personal things with me. For me, after realizing that I was kind of still living with disordered eating behaviors years ago, and committed to this journey of nourishing myself and freedom, I realized the same thing that we’re discussing right now is I didn’t really know what hunger was. I caught myself always just waiting for hunger to be that growling sensation within my stomach. Then once I started tuning more into my body and listening, I realized that most often my hunger showed up in just simple, like, just tiredness. I wasn’t able to really focus as well as I would have if I was not hungry. It can also show up in a little bit of a headache. It can show up, well, if you’re not really fat fueled and whatnot, it can show up in shakiness, because you’re really low blood sugar. Also just like, the attention span, moodiness, there are so many ways hunger can show up. Another common way, and thing that it’s so important that I mention, is if you are always thinking about food. This is a big one. If you’re always thinking about food, and it’s constantly on your mind, you’re trying to answer your emails or do something productive and all you can think about is food, or you’re waking up in the middle of the night, it could be a sign of hunger. Thinking about food is a huge one that I see with the women that I work with. On the flip side, how do you deal with feeling too full? Totally opposite conversation of like, oops, I did it again. I ate all the carbs. What do I do? Britney Spears style, what’s happening? For me, as I said at the beginning of this, I don’t label my diet, but I also don’t label emotions. Emotions are neither good nor bad, they are neutral. Feelings as well, right? A lot of us describe that fullness as a feeling, like, “Oh, I feel so full.” There can be a lot of negativity around that feeling. Then we start beating ourselves up about that, and really like, I’m not that type of person, and I’m not going to say that I am, I want everyone to see that fullness feeling as a thing of nourishment. Hey, if you ate a little too much and you’re feeling a little past full and a little uncomfortable, hey. You nourished your body, and you’re gonna move on. It happens, and now you know hey, maybe I don’t really enjoy feeling this stuffed. Just make a different decision for next time, I guess, based on how you actually want to feel. My main message there would be no negative or positive, right? Those feelings are neutral, essentially. That’s my take on it. What about you? Leanne Vogel: I love that you mentioned that. I’ve been trying to debunk a lot of beliefs that have been implanted in my brain. That might sound totally crazy, but hear me out for a second, everyone. As a woman, I don’t know if you saw the recent story about Doritos, how they’re making a chip for ladies. Did you hear about this? Leanne Vogel: Oh my gosh, you’re gonna hate this. Let me tell you. Meg Doll: Oh, I can only imagine how much I’m going to hate this. Leanne Vogel: Yeah, so basically their whole thing was women don’t like to look messy when they eat. They don’t like people to hear them eating. Basically the gist of the story is women should be ashamed of eating. We shouldn’t feel full, we shouldn’t show other people that we’re eating, so we’re making a chip that’s really tiny, you get a little bit of crunch but nobody will see. It’s less messy, so you won’t have cheese stuff all over your fingers, and nobody will know you’re even eating. Meg Doll: This is why we have the issues that we have. Oh my gosh. That is so terrible. For that situation, like I said, I kind of start by telling people, okay, let’s begin by eliminating any sort of emotion tied with these feelings. Nothing is negative, nothing’s positive. Everything’s neutral. Another one of my areas of expertise and passion, burning passion, Leanne, is helping people with the mindset work, and the way they speak to themselves, so their inner dialogue. That is one of my biggest passions. Like I said, I had wrote this post that said, “Hey, it’s okay to feel full, or be full.” In that moment, I was writing that post and I just had this huge bowl of goodness. I realized after I was done eating that I was like, very full. That’s what inspired me to write that post for people to know that it’s okay to feel full. When I feel those feelings, like I said, I’m aware that it’s neither good nor bad, but I also use my voice. I consciously speak to myself and say, “Hey babe, you’re full right now. No big deal. You had this huge bowl of goodness that you thoroughly enjoyed, and it’s all good.” I ask myself, “Okay, did you enjoy what you just ate?” I obviously say yes, because I take great pride in preparing meals that make me feel my best. If I feel full because of a really nourishing meal, I just use those little techniques and just move on with it, because really it’s not a bad thing. It’s the media, as you’ve just shared with us, kind of telling us that it’s a bad thing and it’s a wrong thing and yada yada yada. Leanne Vogel: Yeah, all the yada yadas. It’s interesting, I was just reading an article yesterday, actually, on the power of talking to yourself in third person. Like you said, you were just talking to yourself in third person. “Hey babe, this happened and blah blah blah… That can go a long way to kind of diffusing the situation, and I’ve done it just without knowing. When I read that I was like, yeah, I guess that would, because you’re not talking as yourself, you’re not talking to yourself, it’s like this other voice that’s speaking with you. I love that you mentioned that. Do you have any tips on how one can start having that conversation with themselves? Some women might be listening now and be like, “Okay. I don’t understand.” What’s the first step to doing this practice, and really allowing you to find your “keto,” and I put that in quotation marks because like you said, I firmly believe too that keto is just a word, and you can really make it your own and still feel great to finding your keto sweet spot, and starting that conversation with yourself. Meg Doll: Oh yeah, and I know you believe that too. Your book, I mean, it’s all things keto, but it’s just so personalized for whatever that might look for you in your own life. I absolutely love it. Let’s talk about this conversation we have with ourselves. For me, I kind of said this is kind of one of my specialties and area of expertise, and that’s because of my background with eating disorders. I would not be where I am today, the woman I am today, without this technique as part of my recovery. What I’ve learned over the years is those who have not dealt with eating disorders also need to know this technique. We all have these voices that are nodding in our heads every single day. As I’ve worked with more and more clients, you know, not all of my clients have eating disorders. I just was more and more aware of how necessary this tool is for everyone. I actually recently created a program called Unbreakable Babe. I guide women through this coaching program, teaching them how to kind of step into this area of like, mindfulness. I walk them through my four building blocks of self love. What’s that? I love self love. I love teaching people how to love themselves, and over the years, I have created this framework that I refer to as the four building blocks of self love. The four building blocks of self love are self talk, self compassion, self acceptance, and self care. What I have learned over the years is that if you do not have those four things in place, those four key things in place, you don’t have this thriving, pulsing, shining bright sense of self love for yourself. We need all four of those pieces in place. Through my coaching program, I help women, and I support them and guide them through those four building blocks. The first one, as I mentioned, is self talk. Everything starts with our awareness, our mindfulness, and the way we speak to ourselves. It’s really about stepping into this place of mindfulness, awareness, being super aware of our thoughts, and knowing that we are in control of how we speak to ourselves. Like I said, I go into great detail on these four building blocks in my program, Unbreakable Babe, but also my book, Keto Freedom, I actually talk a lot about self love. That’s kind of the main message there. Leanne Vogel: I love it. I can’t even believe it, we’re almost at the end of the episode. I just have one last question for you, well, two, actually. What do you feel is missing in the keto space for women? Meg Doll: For me? More talk about self love. I know you are all about creating this sense of freedom within that keto space, right? You want the women that you support to feel free eating this way. That’s why I wrote my book. In all of the areas, I just don’t think people are educated enough on the topic of loving themselves, and how to do that. That can bring so much freedom in wherever you are within your health journey. Since we’re chatting about keto, I really do believe that if we talk more about self love and educate more about self love, there will be more freedom within that community. That’s truthfully what I think is missing in the keto community, but also just the world in general. It’s my message. Leanne Vogel: Mm-hmm (affirmative), I love it. You’re doing great work in that space, so keep on rocking it. My last question is where can people find you? You mentioned your Instagram at the beginning, but any other links or places you want to send people? Meg Doll: Yeah, so definitely head over to my website, MegtheRHN.com. Everything is kind of Meg the RHN. If you look for me on any social media platform, Twitter, Instagram, Facebook, just look me up at @MegtheRHN. I recently just started a brand new podcast. I don’t even know if you know this yet, Leanne. Yeah, so you and I have not chatted, but previously, I’ve been on your show actually two times, I believe now? Leanne Vogel: Yeah, this is the third time. Meg Doll: Lucky me. Honestly, I’m so honored that I’m back, so thank you so much my friend. Yeah, for the past two episodes, you would have heard me chat about my old podcast, The Nourished Podcast. There we really focused a lot on all of the different areas of health, and focused a lot on food and different ways of eating to support your health and whatnot. At episode 150, we said our goodbyes to that podcast, and just now at the end of March, I just released my first episode of my brand new podcast that I am hosting all by myself, and chatting with amazing women. I can’t wait to get you on, Leanne. It is called The Unbreakable You Podcast. It’s really my passion about supporting women and men, stepping into their power of just being this unbreakable person that they’ve always truly been. Every episode, I’m interviewing someone, or sharing nuggets and tools to just be even more unbreakable. That is an update, I guess. Leanne Vogel: I love that. I’m so excited to listen. Oh, that’s great. I just downloaded a bunch of podcasts, because I have free internet right now. I’ll make sure to check out yours too. That’s so exciting, congratulations. Meg Doll: Thanks, love. That means so much to me. Leanne Vogel: Yeah, so thanks so much for coming on the show, Meg. The show notes and full transcript for today’s episode can be found at HealthfulPursuit.com/podcast/E82. Thank you! Meg Doll: Thank you, girl! Leanne Vogel: Leanne Vogel: That does it for another episode of The Keto Diet Podcast. Thanks for listening in. You can follow me on Instagram by searching Healthful Pursuit where you’ll find daily keto eats and other fun things. 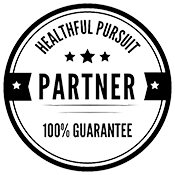 Check out all of my keto supportive programs, bundles, guides and other cool things over at HealthfulPursuit.com/shop. I’ll see you next Sunday. Bye.